It's peculiar how mind travels. 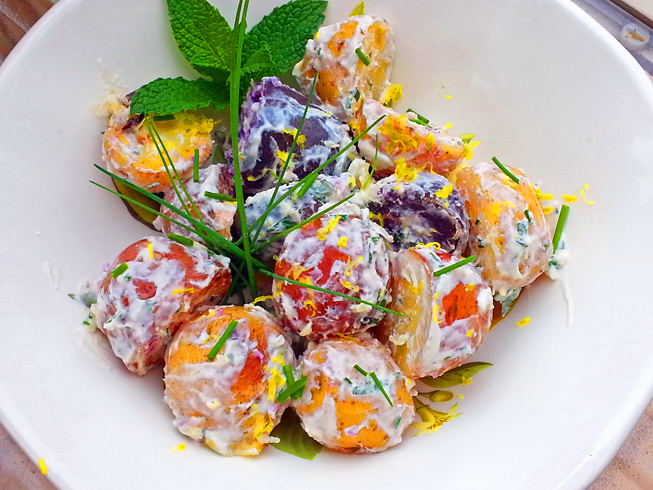 As I sat down to write this blog post, I wanted to describe a perfect summer picnic side dish, instead, I am walking down the memory lane, to my charmed childhood summers. Every summer, our huge, scattered in different parts of the country, extended family would gather in Odessa for vacation. One group of relatives would succeed the previous, and I would get a chance to play and get in trouble with my favorite cousins, whom I was only able to see during the summer months. To keep us out of trouble, for a little while, our parents would pack food and take us to the beach early in the morning.There, my cousins and I, would try to absorb all the water in the sea:- dive for mussels, try to catch tiny shrimp and fish and jump in the water from the pier, competing for the perfect form. At lunch time, the fathers took upon themselves the uneasy task of getting us out of the water, while the women set up a feast on the beach blanket. We had no coolers, and it was essential to pack food that would not spoil easily. My mom, packed picnic food in mason jars decades before it was THE TREND (no Tupperware either):- hard boiled eggs, whole tomatoes, cucumbers, bread, fruit and my favorite - boiled baby potatoes smothered in garlic butter and dill (It is still my ultimate comfort food). Years passed, our big extended family, now scattered throughout the world, doesn't gather as often for summer vacations anymore. I miss my cousins, who are all grown up and have a bunch of little rascals of their own, but those summers filled with laughter and splashes will always be apart of me. 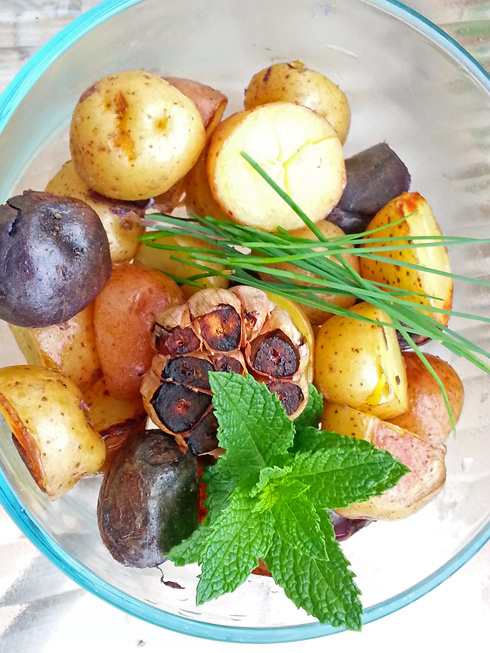 The following recipe is a tribute to my all time childhood summer fave: - Mason jar dilled and garlicky baby potatoes. Boil or roastpotatoes, don't let them get mushy. 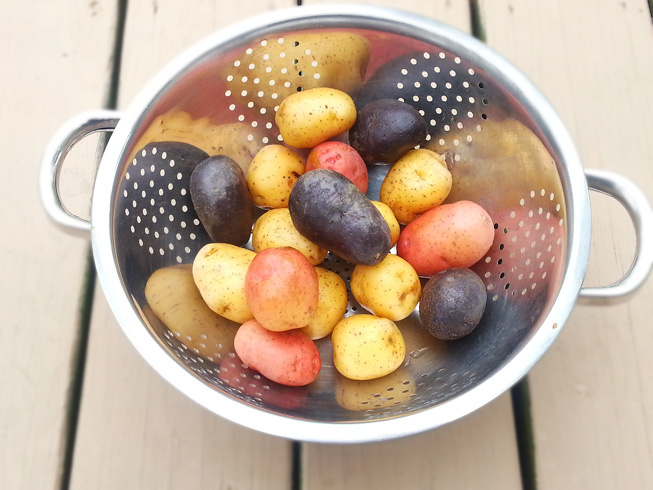 Toss the potatoes with salt and 2 tablespoons oil and cool. Cut garlic tops off, place garlic on aluminum sheet pour a little olive oil on the garlic wrap in the sheet and roast or grill for about 30 minutes until it's brown and fragrant. Put the yogurt into a bowl and squeeze the pulp from garlic cloves into the yogurt. Stir well to combine, add the mint, dill chives, and lemon juice. Fold the yogurt mix into the potatoes and coat gently. Best childhood memory! Thanks for sharing!!! Those were perfect with the lamb kebabs!